In a large skillet over medium heat add olive oil, garlic and jalapenos. Sauté until garlic starts to brown. Reduce heat to medium-low, add spinach leaves and sauté until wilted. Add 1 tsp Slap Ya Mama Original Blend Seasoning, pepper jack cheese and sour cream. Stirring continuously, cook mixture until cheese is melted. On a clean surface, lay chicken breasts flat and season with the remaining 2 tsp of Slap Ya Mama Original Blend Seasoning. Spoon a little spinach mixture onto each breast. 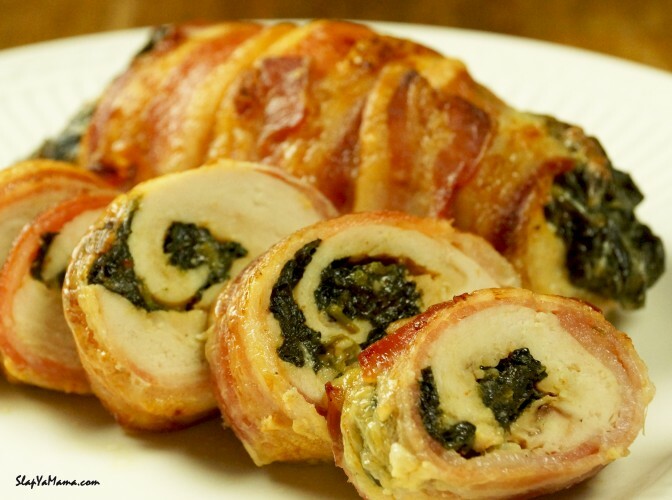 Roll up each breast with spinach mixture inside and wrap each breast with 2 or 3 slices of bacon, securing the ends with a toothpick. Arrange breast on a baking dish. Bake uncovered at 375 degrees F for 35 minutes. Then set oven to broil and broil for 10 minutes or until bacon is browned. Remove toothpicks, slice into medallions or serve whole and enjoy!